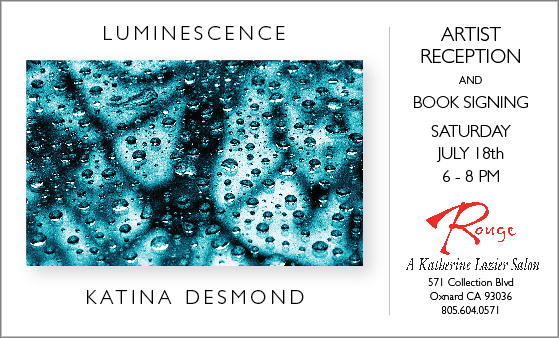 Current permanent installation "Luminescence" is a solo showcase of 22 recent works by artist Katina Desmond. Printed with a medium that infuses dyes directly into specially coated aluminum sheets, this process and Desmond’s imagery combine to emote a magical luminescence. A publication of the installation is available in a book designed by the artist titled "Delicate and Bold". Katherine Lazier believes that dreams come true, and the opening of her high-end boutique salon, Rouge, at The Collection Riverpark in Oxnard is concrete evidence they do. Katherine’s lifelong dream of owning her own salon and also featuring works of talented artists has finally blossomed.